Long live Gregory, the ‘Cool Ruler’ and this VP series. Assuming that the artists or their nominees are benefiting from the series, VP Records are to be congratulated on the recent release of some high quality reggae music. 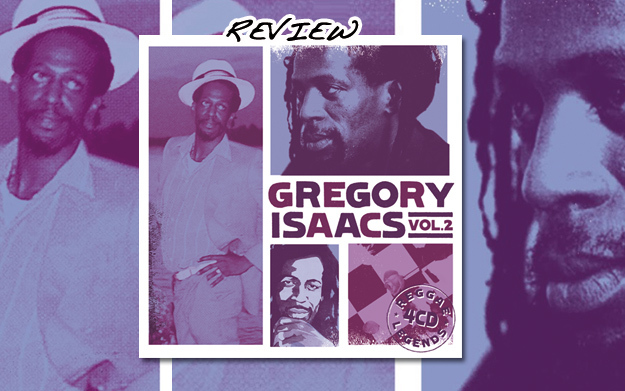 Following hard on the heels of Culture, the Mighty Diamonds, Garnet Silk, Barrington Levy, Eek-A-Mouse, Barry and Dennis Brown and many more ‘anthology’ or legend type collections, comes this CD quartet of Gregory Isaacs’ material. This is a generous 42 track collection that sits well alongside VP’s already extensive commitment to the artist’s legacy. The 4 albums in the set are: Private Beach Party, Red Rose For Gregory, I.O.U. and Victim. My last recollection of Gregory Isaacs is double dose dates at the Jazz Café in London town, shortly before his passing. Having ‘crossed a vast amount of water’ to see the legend live, I was not disappointed – even though Gregory’s input to each show ran to a mere 20 minutes or so. As Sip A Cup’s Gussie P. on the mixing desk explained: ‘the spirit is willing, but the flesh is weak’ – and so it was that Gregory passed before his 60th birthday. Whilst a combination of lung cancer and cocaine addiction took their toll, none can deny that Isaacs’ possessed the most mellow and mellifluous of all vocals in the genre we call reggae. Hence, this compilation is a welcome reminder of that dear departed talent. The four CD box set spans the 1980s era and will serve well those who failed to keep up with the artist’s phenomenal output (at a reputed 500 albums or more) during his lifetime. Only the cold hearted could fail to be entranced by such tracks as Red Rose For Gregory, Teacher’s Plight, Rumours, Slow Down, Closer Than A Brother, Private Beach Party, Feeling Irie, No Rushings and Let Of Supm. Add to these the hit tunes Rumours, Mind U Dis, Rough Neck, Too Good To Be True, Report To Me, Rosie’ and Mr. Music Man and there’s more than enough melody to help you coast through the most testing of tribulations. Isaacs’ material is excellently and extensively embellished by (amongst others) the Roots Radics, Sly & Robbie and Steely & Clevie - with some brass inputs thrown in for good measure. The generous box set also features such luminaries as Jimmy Cliff, The Mighty Diamonds, Carlene Davis and Mutabaruka. Unlike many in the aforementioned VP anthology series, this set does not include an informative booklet on the life and times of the legend, track details or a DVD clip of Isaacs seducing the female massive at Brixton’s Academy or any other venue. Nor does the sparse production accommodate Gregory’s golden gift track Night Nurse - or any of the other endearing classic tracks off this Island album release. However, it does aptly serve to remind us that he was a ‘once off’, blessed with a voice that has been neither matched nor surpassed. Long live Gregory, the ‘Cool Ruler’ and this VP series.